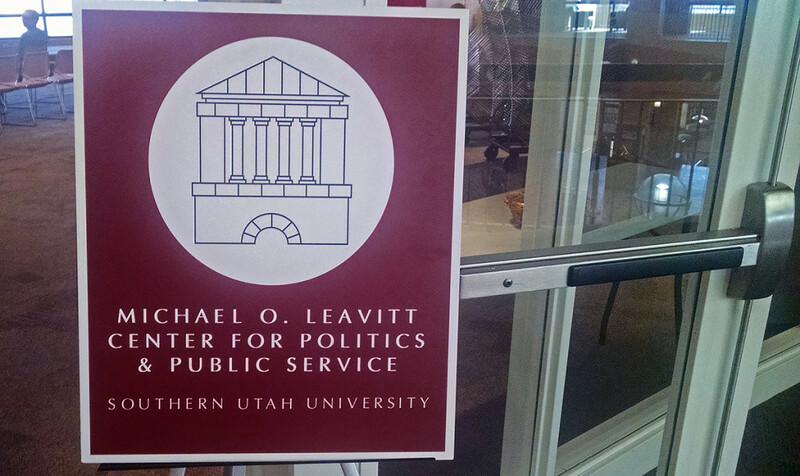 CEDAR CITY – Southern Utah University’s Michael O. Leavitt Center for Politics & Public Service hosted an immigration forum Thursday at the Sharwan Smith Center on the SUU campus in Cedar City. 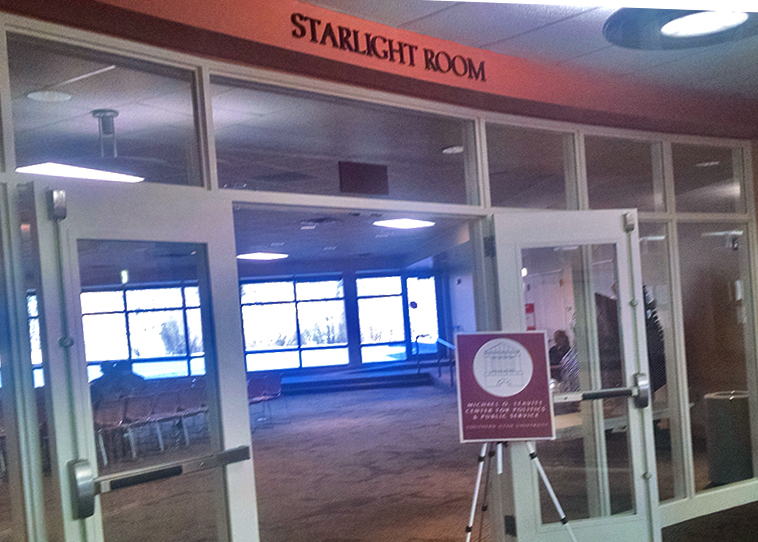 The panel, comprised of political leaders as well as the director of SUU’s Hispanic Center, discussed in detail the complicated facets of immigration and each panel member’s respective position on the question of immigration reform. 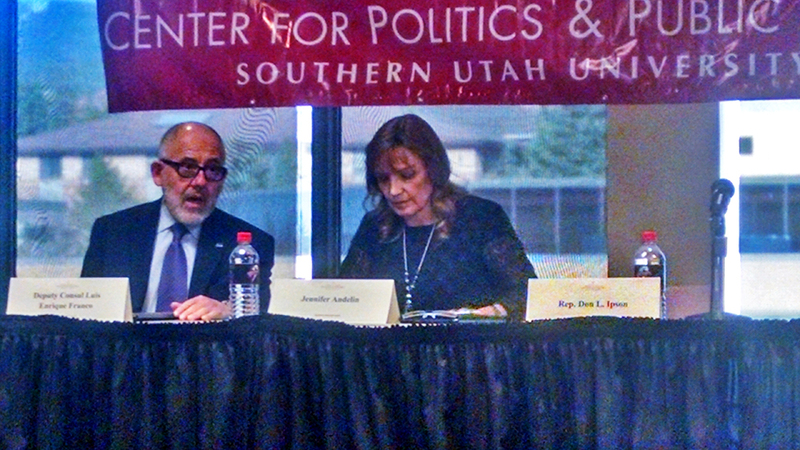 On the panel were Jennifer Andelin, senior advisor on immigration to Congressman Jason Chaffetz; Luis Enrique Franco, deputy consul of Mexico; Rep. Don Ipson; Rep. Mark Wheatley; and SUU Hispanic Center Director Jonathan Puente, J.D. Sen. Evan Vickers was also in attendance at the event. All five panel members agreed that some form of immigration reform is needed in the United States and that the system is broken and needs to be fixed. That was where many of their agreements ended, as each had a different take on what “fixing” the system really means and the approach that should be taken. Franco’s chief focus during the panel discussion was emphasizing that the three North American countries, the U.S., Mexico and Canada, should work together rather than fighting each other. Puente spent a great deal of time trying to help the audience see the perspective of immigrants currently living in the U.S. without legal permission. His aim, he said, was helping the audience understand why a pathway needs to be created to help those people obtain citizenship. Legal immigration is far too difficult, Puente said, as evidenced by details posted on the United States Citizenship and Immigration Services visa bulletin for individuals who have recently been granted visas. In many cases, he said, these individuals started their application processes as far back as 1989. Ipson, who said he is bothered by the insecurity of our borders and doesn’t approve of people living illegally in the U.S. and taking advantage of things like free health care, said as long as the “front door” – the legal immigration system – is difficult or impossible to use, people will continue entering the U.S. through the “back door,” or illegally. Andelin agreed that the process of entering the U.S. needs to be easier, faster and cheaper for applicants, stressing that for some people, legal immigration takes decades; and for others, the option of legal immigration literally does not exist. However, she said, she and Chaffetz, whom she represented at the forum, believe that while something needs to be done to legalize the millions of individuals living illegally in the U.S., granting them U.S. citizenship is not the answer. Granting citizenship to those living here illegally would be giving too much to people who have chosen to disregard the country’s system and rules, she said. There are currently two paths to citizenship, Andelin said: being sponsored by an employer and being sponsored by a family member. She clarified that only an immediate family member, like a spouse or a parent, can act as a sponsor on the family side – not someone like an aunt or an uncle. One woman she’s been working with, Andelin said, has been trying to legally immigrate for 36 years and is currently about two years away from being able to move to the U.S. Yet others enter the country illegally, commit felony crimes and then claim “credible fear,” she said. Even if they don’t have real justification for their claims, they are granted asylum and work permits for years while they wait for the system to determine the validity of their claims. Wheatley said having so many individuals living illegally in our country has serious drawbacks – but simply deporting them all would be catastrophic to the economy. Comprehensive reform is needed to make it possible for the majority of these people to work something out, he said. Ipson also stressed that the U.S. needs immigration to fuel growth in the economy. The immigration reform process needs to separate those who are contributing to economic growth from those who commit crimes, he said. Ipson additionally emphasized that it’s not OK for those who have entered the country illegally to be allowed to continue taking advantage of the system. The moderators asked the panel to discuss amnesty, sparking the expression of various viewpoints among the panel members. Wheatley said he believes amnesty should absolutely be offered to those living in the U.S. illegally who haven’t been in trouble with the law. The U.S. will benefit from these people paying taxes, he said. He also emphasized that giving these individuals amnesty will not work if the border is not also secured. 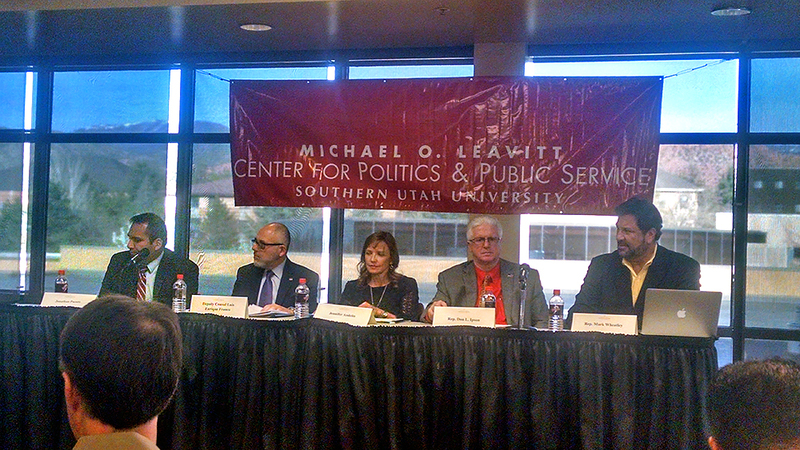 Puente said that amnesty is frequently discussed in a negative light, but it can be a great tool. His own family was granted amnesty after it was instituted in 1986 under President Ronald Reagan, he said, and that opened the way for him to attend law school. Amnesty creates a way for people who broke the rules and entered the U.S. through the back door to enter through the front door instead of “getting in the back of the line,” which doesn’t work for many people because there is no legitimate line, he said. Ipson said he doesn’t believe that the millions of people living in the U.S. illegally are taking jobs from U.S. citizens, especially with unemployment numbers currently at a very low percentage. These people are helping the economy, not hurting it, he said, and deporting them would destroy the economy. Andelin said amnesty isn’t the answer, because citizenship is too great a gift to bestow on those who disregard our system and break the rules. She said the solution is to get these individuals work permits or visas so they can continue living and working in the U.S. It would be easy to create a method that allows them to live their lives here without making them full-fledged citizens, she said. Puente interjected at that point; he strongly believes, he said, Andelin was beginning to suggest something that is ethically wrong. Simply giving work permits to these millions of people creates a divided class, he said, putting some human beings on a lower footing just because they weren’t born here and creating two different classes of people in a country where we teach that all men are created equal. Andelin then jumped in; he said there is a downside to the amnesty Puente advocates. Amnesty solved immediate problems in 1986, she said; but for all the immediate problems it solves, amnesty also creates new ones, as more people will illegally come to the U.S. assuming that they, too, will receive amnesty. Many people are currently coming to the U.S. or sending their children because they believe amnesty will be granted, she said. Franco spent some time talking about the North American Free Trade Agreement, saying the U.S. has benefited greatly over the years from NAFTA. Mexico is the U.S.’s third-largest trading partner, he said. NAFTA was supposed to allow for the free flow of people or work labor within North America, he said, but that got pushed aside because it couldn’t be fully agreed upon. The issue was supposed to be revisited but never was, he said. He believes, he said, if that aspect of NAFTA had been included or revisited, the U.S. wouldn’t have such a large immigration problem and would be enjoying an even greater economic benefit from NAFTA. After World War II, Franco said, the Bracero program brought Mexicans to the U.S. to get jobs, and it was successful. The U.S. reaped economic benefits during that time by having seasonal workers travel from Mexico, then return to Mexico after the season was over and they were no longer needed. When the U.S. sealed the border, he said, it killed that cycle of migrant workers and a great source of help for U.S. farmers and ranchers. 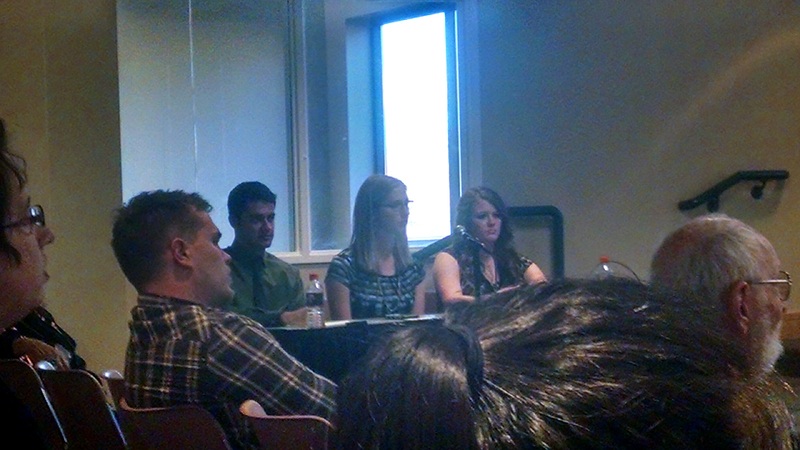 Andelin talked about an engineer she has been working with who is trying to legally enter the U.S. to work. Even though he has skills that are highly sought after, she said, the process of coming to the U.S. has already taken him 12 years. He only wants a green card, not citizenship, she said; but even though he has an employer that is sponsoring him, there are so many problems with the current system that people like him, whose entrance into the U.S. would benefit the economy, are struggling greatly to be able to come here. “If you were king or queen, how would you handle immigration reform?” he said. Andelin said the reason nothing productive is happening with regard to immigration reform is because we’re trying to attack the problems in one single bill, and that’s not possible. If separate bills were created to address each issue individually, she said, then at least the most important immigration issues could be taken care of. If we go for all or nothing, we’ll get nothing, she said. Puente said he would create a pathway for people to come out of the shadows, including implementing background checks and having immigrants pay dues through fines or military service. Franco said North America should be thought of as a single region and not three countries, and we should work together to create that. Seventy-five million baby boomers will soon retire, and the U.S. will need to find people to work and produce and keep the economy moving forward when they’re gone, he said. Ipson said he would secure the borders so the economy doesn’t suffer. He would then make work visas available or find some way to make taxpayers out of those who are living here illegally. He reiterated that he would separate out the felons and lawbreakers. He would also “fix the front end of this and remove all the red tape that exists,” he said, so those who want to come to the U.S. legally have a legitimate method of doing it. Wheatley said he would enact comprehensive federal immigration. He said he would also enact a new foreign worker system and make work visas permanent, so those possessing them will have some predictability and not have to worry about being deported if they lose their jobs. He said he would also make it possible for youth who graduate from college or serve in the military to have a full path to citizenship. 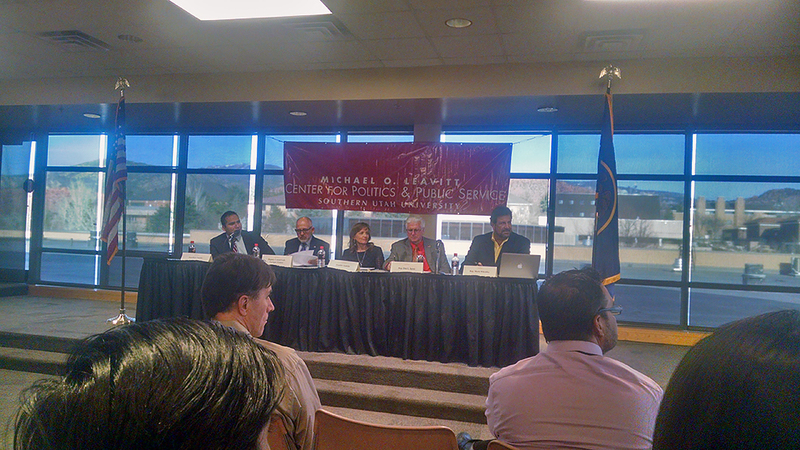 Other topics of discussion included whether Utah, like California, should grant driver’s licenses to those living here illegally; the impact of deporting parents whose children are now official U.S. citizens; and whether health care, other citizen benefits and constitutional rights should be extended to those living in the U.S. illegally. “The Constitution is the law of the land … if you start excluding people from these rights, where does it stop?” Puente said. “It’s important to respect human rights,” Franco said. St George News, I applaud you for taking the take and effort to cover this. These kinds of articles are much more valuable than the latest car accident. 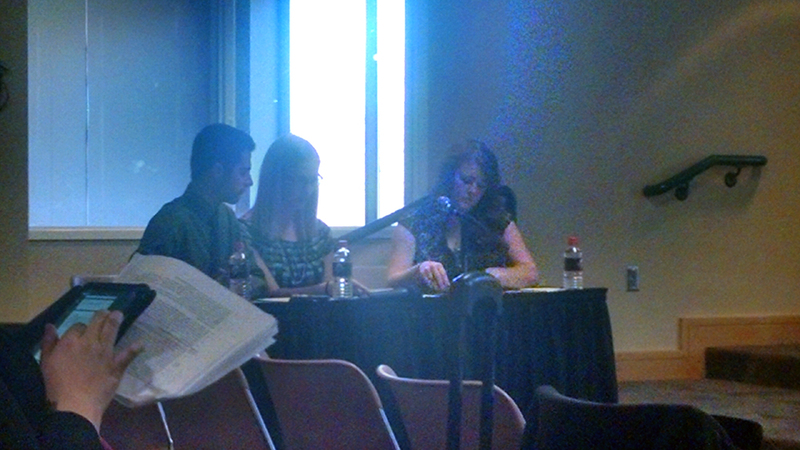 I wish one of these panelists has brought up something I read in Forbes. 40% of fortune 500 companies were started by Immigrants and they’re children. It’s my belief that this is because the type of person that would be willing to uproot they’re entire life to move to the U.S. so that they can try to make a better life for themselves is also frequently the type of person that would be willing and able to put for the time, effort and energy it takes to start a successful business. like we need more taco shops or “landscapers” around here.